Cut your fuel bills, reduce emissions and stay cozy-warm—here's everything you need to get an insert that's right for you. “If you’re putting a fire in your house—on purpose—it’s probably best to work with an expert.” That’s the opinion of Tim Reed, Hearth Expert and retail team leader at Fireside Home Solutions in Portland, Oregon. Luckily, he’s an expert on all things fireplace-related. And if you have a question about whether or not it’s time to consider a fireplace insert, he’s definitely the guy to talk with. What Sets Fireplaces Inserts Apart? “Gas is a good choice for people who want to hit a button and have instant beauty,” Reed says. 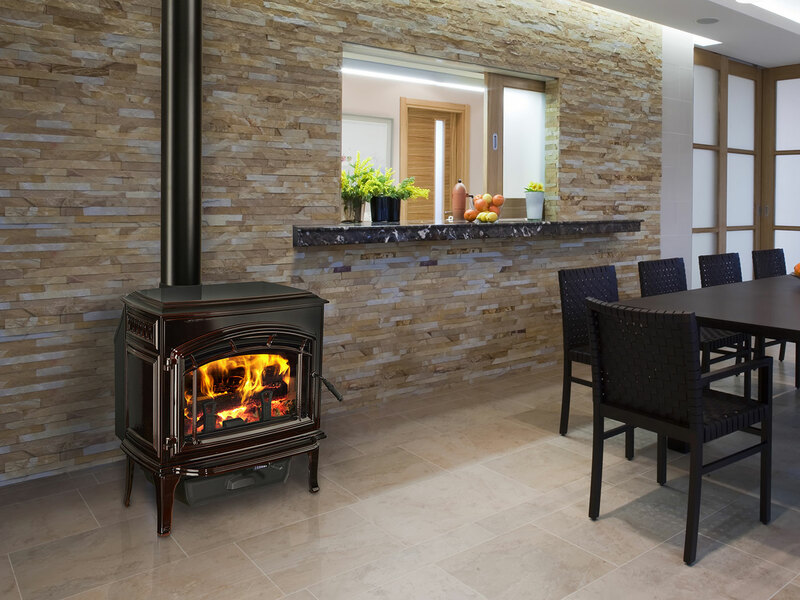 “While it doesn’t give off that dry wood heat, the convenience factor is pretty significant and its incredible how real they look.” Read about Quadra-Fire gas inserts here. If you decide to go with a gas insert, you can choose from basic metal or premium FireBrick™ inserts. “That premium FireBrick™ makes Quadra-Fire special,” Tim says. “Inserts with FireBrick™ have a significantly larger viewing area, for one thing. Plus, it’s made from thick ceramic material, so it holds more heat in the room than a metal firebox will. Because of that, you won’t need to rely on a fan to radiate the heat, so you’ll have a quieter experience. I always tell people that if they want to be able to read quietly or watch TV comfortably, they should go with FireBrick™ inserts.” Follow the links to learn more about Quad’s FireBrick™ inserts--Q135FB and Q130FB. Prefer to burn solid fuel? “This gives you the feeling of dry wood heat with the convenience of an automated system,” Reed says. “It’s a great green fuel, since the pellets are made from sawdust that would otherwise be discarded. You toss the pellets in the hopper, set the thermostat, and it takes things from there.” Read more about Quadra-Fire pellet inserts here. “Getting a wood burning insert can give you up to an eight-hour burn, compared to perhaps two to two-and-a-half hours with a conventional wood burning fireplace,” Reed says. “Not only does it give a long burn time and use less firewood, it also burns nearly 20-times cleaner than a standard wood fireplace.” Read about Quadra-Fire wood burning inserts here. Once you’ve made the decision to get an insert, plan on the installation taking at least half a day, depending on the specifics of your insert type and the space in which it’s being installed. “It’s most often a low-risk, low-mess project,” Tim says. Look Tim tells prospective insert buyers to collect some pictures of what they want by searching HGTV, Pinterest and Houzz. Tim says: "I guarantee that with all the variety available through Quadra Fire, we'll be able to find a look for just about every home, from clean and modern to rustic and traditional." Size Take measurements before you visit your Quadra Fire dealer: front, back, width, height and depth of current fireplace. Once you have those dimensions ready, your dealer can find an insert that's just the right size, provides the perfect amount of warmth and fits the style of the room. Installation Most installations will take about half a day, depending on the specifics of your insert type and the space in which it’s being installed. “It’s usually a low-risk, low-mess project,” Tim says. Solid Fuel-Burning Finishes Finish options are traditional steel or cast iron. “The cast iron can be very ornate, and it has the advantage of holding heat a bit longer than steel,” says Tim.